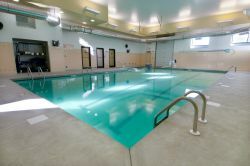 With aquatic physical therapy or "aquatic therapy", your rehabilitation program is conducted in our safe, clean and comfortable warm water environment. Our programs are custom designed for each patient. No more pain with every step, fear of falling, or apprehension with exercise. This is exercise in the water without any swimming. You don't need to know how to swim to be successful with this type of treatment. Experience the 3-Fold Power of Water! Assists: Water assists body parts that work against gravity and help make flexibility gains. Supports: The buoyancy helps reduce pain and make exercise comfortable. Resists: Water offers resistance in all directions to help develop strength. Buoyancy – floating in the water allows you to exercise with up to 90 percent of body weight removed. This dramatically decreases painful joint compressive forces and fear of falling. Temperature – the warmth of the water results in relaxation and pain reduction by inhibiting pain pathways. Turbulence – this property is the ever changing flow of the water which imparts safe and gentle forces on the body to help improve your balance and core stability. Viscosity – this is the "thickness" of water which allows for gentle and progressive resistance to aquatic exercise. Hydrostatic Pressure – the pressure exerted on your body when it is submerged in the aquatic environment. This pressure can assist with the return of blood to your heart from your legs while exercising.